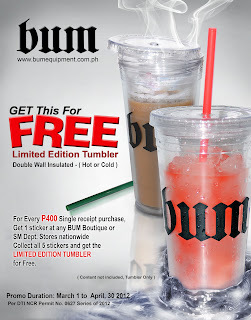 All you have to do is purchase of any BUM items worth P400 Single receipt and you can get 1 card plus automatic 1 sticker at any BUM Boutique or SM Dept. Stores nationwide. Collect all 5 stickers and get the limited edition tumbler for free. The promo will run from March 1 to April 30, 2012. 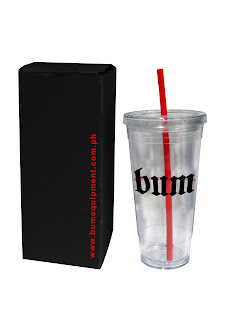 For every completed cards, you may claim the Tumbler at their Promo Staff at any BUM Boutique and SM Dept. Stores nationwide. 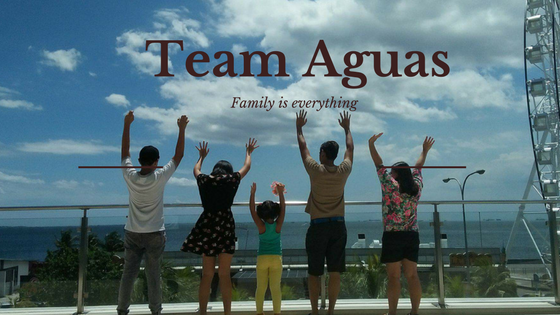 Redemption is until June 30, 2012. · Customer can accumulate/earn a sticker for every P400 single receipt purchase in any BUM Boutique and SM Dept. Stores nationwide through our Promo Staff. · Each card has a control number and must be distributed in an arranged series per outlet/store. · Each completed card must be surrendered to the staff and stamp it with “CLAIMED”. · Combination of 2 cards is not allowed. · Uncompleted card after the duration date will be mark as void. · Customer must present card and receipt to get corresponding sticker at our Promo Staff. Each sticker and receipt must be signed and dated by the staff and the receipt must be stamped “CLAIMED” as well. · Each outlet/store will be provided with a number of cards and stickers. · This cannot be used in conjunction with other promo. · The free Tumbler cannot be exchanged for cash, other products or discounts.